The book of Exodus is rich with wondrous stories. When Moses first encountered God, his staff turned into a snake, and his healthy hand became leprous. Then, when Moses and his brother Aaron first met the upper echelons of the Egyptian government, his staff turned into an alligator that swallowed the staffs of the Egyptian sorcerers. Egypt’s pride was based, in part, on these sorcerers and their magical skills. So God’s miraculous acts opened the lines of communication with the Egyptians in a “When in Rome, do as the Romans” manner. Efraim and Hannah Hareuveni explained the Hebrew word for bush – sneh – through its prominent thorniness. They noted, as did our Sages, its similarity to the name of Mount Sinai. According to Pirkei de-Rabbi Eliezer,(1) from the sneh we get the name Mount Sinai, which is Horev (Pirkei de-Rabbi Eliezer, 41). Both sneh and Sinai contain the Hebrew letters samekh and nun. Replacing the samekh with the letter shin/sin, (not an uncommon occurrence) spells the word shen, which means “tooth” in Hebrew. According to the Hareuvenis, one of the physical features of Mount Sinai was its resemblance to sharp teeth. The same can be said of the thorns of the blackberry bush. 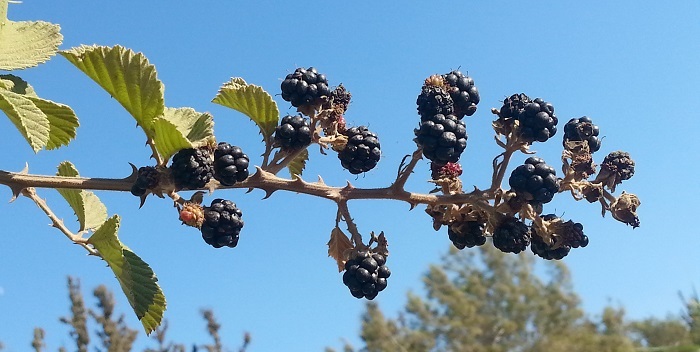 Noga Hareuveni, the founder of Neot Kedumim and the son of Efraim and Hannah, also identified the burning bush of Exodus as the holy blackberry. He added to the explanation of his parents the reference to the biblical book of Samuel 1, which describes a very “sharp-toothed rock” where Jonathan tried to go to the Philistines. The rock is called a seneh – and it contains the same samekh and nun that we also find in both the burnish bush, the sneh, and Mount Sinai. Among other things, Noga based his explanation on the continuation of the Midrash in Shmot Rabba that teaches that the vision that Moses saw was only in the upper portion of the bush, which is very fitting, as mirages are often seen several inches above the ground. The blackberry is a member of the Rosaceae (rose) family, and grows in the Mediterranean region and in damp areas and deserts near water sources. In Israel’s north, there is another member of the same genus – the wooly raspberry (rubus canescens). According to Pirkei de-Rabbi Eliezer, the uniqueness of the plant’s natural habitat is that “the bush is only found…where there is water underneath” (Pirkei de-Rabbi Eliezer, 40). 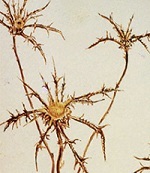 Its long branches climb over other plants or create a thicket whose thorns hook onto them. Shepherds use the thorns to remove leeches. Because the blackberry bush grows in moist climates, its blossoming season is very long – from April until September. Parts of the plant contain substances with medicinal uses that can be used to treat wounds and infections. It can be boiled into an extract, syrup, or even an alcoholic beverage. The pink flowers are arranged at the end of the branches. The fruit, whose color ranges from red to black, is a clustered berry, which is succulent and very sweet. The Sages also used the blackberry as part of a parable for finding a perfect match. “A man should sell all he has to marry the daughter of a scholar, and he should marry his daughter to a scholar. This is like grafting grapes of a vine with grapes of a vine, which is pleasant and acceptable. But he should not marry the daughter of an ignorant man, which is like grafting grapes of a vine with berries of a sneh, which is repulsive” (Babylonian Talmud Pesachim 49a). With the New Year upon us, as we soul-search the past year, we hope that the days ahead of us will be peaceful. Even when there are “thorns” on our paths, we strive for the strength and inspiration of Jewish history, and from our long, winding path that has contained more than just a few “thorns.” But hope, tenacity and perseverance characterize us, and provide us with the belief that “out of the strong came sweetness” (Judges 14:14). The Midrash appropriately taught that “from the sneh comes a rose” (ShirHaShirimRabba, 6). May the year of curses come to an end, and give way to a new year of blessings. Amen! (1) A midrashic work attributed to Rabbi Eliezer ben Horkanus, late 1st century-early 2nd century CE. (2) N. Hareuveni, Tree and Shrub in Our Biblical Heritage.Translated by Helen Frenkley. (Israel, Neot Kedumim, 1984), p. 39. (3) YalkutShimoni is a comprehensive Midrashic anthology that was compiled in Germany in the 13th century. (4) Rabbi Shmuel ben Meir (1085-1158) was a biblical commentator from Troyes, France. He was a grandson of Rashi.